I was going to do a little before and after so you could compare the new pictures to the old since both have been published, but it's late and I'm going to turn in, so if you are curious, here is a link to Bill Ingrim's version of the same home. Which do you prefer? I fully agree that the bedroom is the pinnacle of perfection! That bed! That bedding! Those curtains! That chair! Boxwoods in the windows? I die! Such a great space! Thanks for sharing! I miss Cottage Living magazine, and also Country Home. I wish they'd come back. That cottage is so cozy. My preference is Bill Ingram's style, but the other is lovely too. Bill's is a little more modern and masculine, which appeals to me. 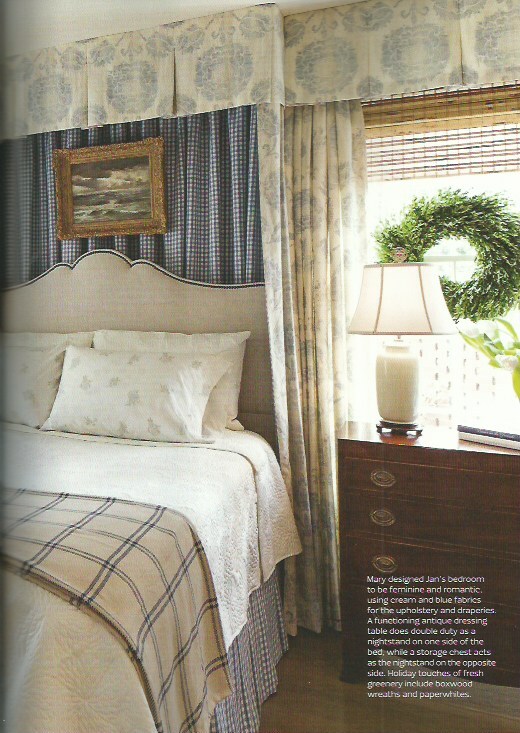 I really like his decorating in the master bedroom (and love his dachshund, Maggie! ), with the simple white bed linens and no window treatments. 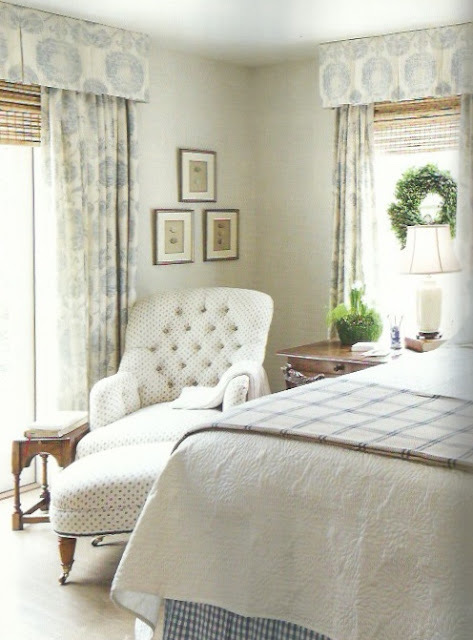 And the little round mirror hanging over the bed -- a small detail, but the perfect crowning touch. His master bathroom is wonderful too. Thanks for sharing (and good job with the links opening in a new window!). Did I spy beautiful wood counters in the kitchen, if so WOW! I love charming and small. I have zero desire for a big house. This is simply charming. I bought the Cottage Journal on your recommendation, and it did not disappoint. I couldn't find any online images either, so thanks for posting these. 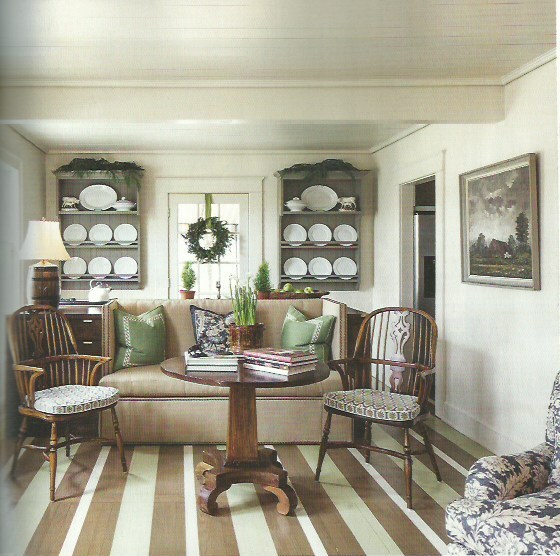 I prefer the new owner's cozy choices, but I'm glad she kept the painted floor. Bill Ingraham is working on a major house in Atlanta with Danielle Rollins that I'm following on Instagram. It is waaay more house than this cottage, but it is fun to see the details they are choosing. I agree with you about the real and faux greens inside. Over the years, I've added really good-looking greenery (long-leafed pine boughs and magnolia leaves mostly) purchased at after Christmas sales, and it looks really good. If we're having company, I'll add a few fresh magnolia leaves or holly stems to freshen things up. Thanks again for posting. Enjoy the season! 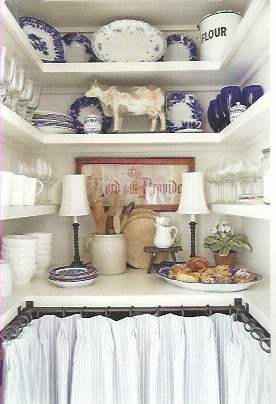 It is such a good issue of The Cottage Journal, I could not leave the store without it either! I prefer the the new homeowners decor choices. It has been awhile since I enjoyed a magazine so much. I loved the little blue and white plates under the lemon cypress mini trees, too. Pretty perfect. So lovely! I am so glad you shared! I prefer the house now, but they are both lovely. For years I've done the Williamsburg thing off and on and made my own boxwood wreaths, but they do get so dry, even outside since our door is south facing. Last year I used dye and glycerin to preserve some boxwood from my yard. It turned out well in the wreaths I made, and since I was making over some gaudy older electric window candles a friend had passed along, it was worth it to make my own, but I'm not sure it was worth it for the full sized wreath. The faux stuff you can get these days looks so good! I don't blame you a bit! Love the redo. Bill's is a little to masculine and urban for me. But, obviously he is a great designer. Would be a dream to do over a place amd be able to afford everything you want the way you want. Thank you for sharing. I love Bill Ingram's work. I also enjoyed seeing some of my all time favorite rooms dressed for Christmas (great minds think alike) in the links you provided. There are several that I have hard copy images of. Some rooms are magical for me...I never tire of them, even years later. This is such a pretty house. Thanks for sharing! Not sure I would have picked up the magazine for lack of time! 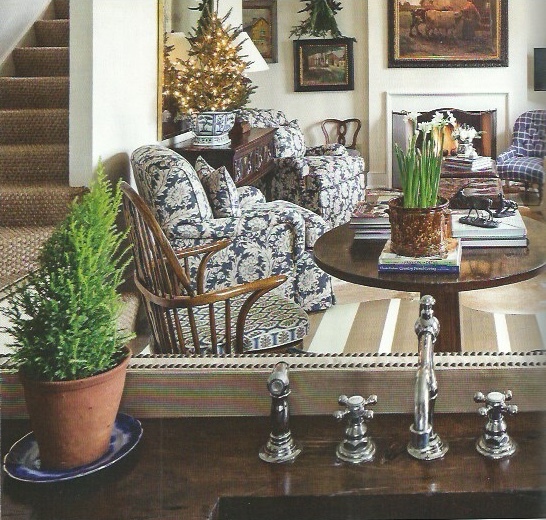 I am an absolute believer in classic and cozy decor. So much today leaves me feeling cold or temporary. Hello. 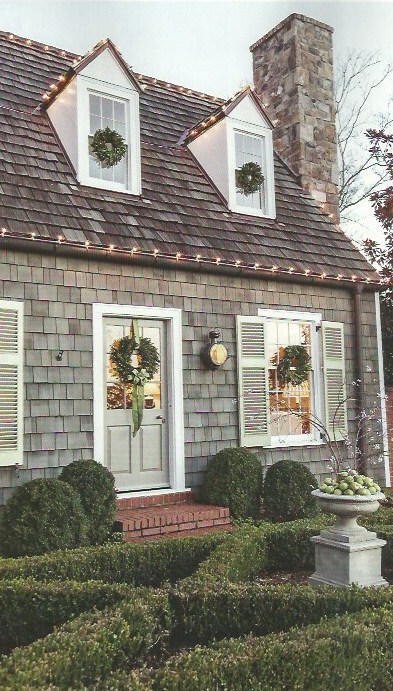 I just found the above exterior image on pinterest and clicked through to your blog. Thank you for sharing these images. I use to salk (real estalk if thats a word) this house when it was for sale. I love seeing what the new owner did to the space. And what a fabulous job she did as well. Hello. I just found the above image on pinterest and clicked through to your blog. Thank you for sharing these images. I use to real estalk this house when it was for sale. Its so fun to see what the new owner has done to it. And what a fabulous job she has done as well! Love the images you presented herein. The cottage is cozy and welcoming and the new owner did a beautiful job! I could easily move in yesterday! So much enjoy your talents and images presented in your blog...a favorite for sure! Merry Christmas!